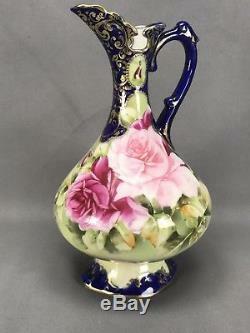 Hand painted ewer with large beautiful roses. The spout and handle of the ewer are colbalt blue with gold gilding and beading. The base is also colbalt blue with gold gilding. Check out our other listings for more Nippon! This Ewer is unmarked, but was bought with a smaller ewer with similar pattern that has blue maple leaf mark no 52. The smaller ewer can be seen next to the ewer that is for sale in the photographs. SMALLER EWER IS NOT FOR SALE ON THIS LISTING. It is available on another on of our listings. Some wear to the gilding on the handle. Due to item manufacturing date normal wear is to be assumed given the age. The item "Nippon Porcelain Hand Painted Ewer Colbalt and Gold with Rose Floral Pattern" is in sale since Wednesday, July 26, 2017. This item is in the category "Pottery & Glass\Pottery & China\China & Dinnerware\Nippon". The seller is "charlieschina" and is located in Newport News, Virginia. This item can be shipped to North, South, or Latin America, all countries in Europe, all countries in continental Asia, Australia, South africa, New Zealand.